Tiny Ranker Review, yes that’s what this article is all about, Now you might be wondering, if it’s a review, probably it has an affiliate link attached to it, or I’d be paid to get you signed up. Let me tell you, I won’t! They don’t have any “paid” signup kind of programs, or even if they do, I’m not associated with it. So what’s the point? Why am I scribbling this review down at the first place? Here’s the thing, I’ve been in this industry long enough, and I’ve tried a lot of different SEO Tools over time. They were good too, of course. But, then I found Tiny Ranker, and that’s when I realized what was missing. You can check another important tools for website name suggestions and grammar checker and plagiarism checker also. Simplicity and budget-friendly! That’s what was missing. The other “premium” tools I’ve tried, made themselves extremely complex in the attempt to be “feature-rich”. That’s a hurdle Tiny Ranker easily overcomes. It’s feature rich, extremely! And it has an even simpler User-interface, so that was the first point of me being in love with this tool. And then comes the thing about being “pocket-friendly”. Let me tell you, I’ve paid over $250/month for SEO tools! They did the job, yes, perfectly, but they were extremely overpriced! $250 is an average salary in the country where I live. While TinyRanker’s second feature that hit me with the cupid was it’s extremely low pricing! It starts from as low as $19/month! WELL YEAH! That’s true! Why am I including the pricing and stuff at the very beginning of this article? Well you need to know that you can AFFORD a tool at the first place, before reading the rest of the story, right? I mean doesn’t matter how awesome Aston Martin is, you can’t afford it, so it’s reviews are useless for you aren’t they? That’s the reason why the pricing in this article is where it is. Infact why read the review? I say Try our their 30day – FREE trial right now! I guarantee you, you’d marry this tool in your first 5minutes with it, that’s a GUARANTEE! But in case you aren’t feeling romantic exactly, I’m here to take you on a detailed overview of the tool, trust me your next 5minutes on this article are going to pump you up with adrenaline. Specific keyword based URL checker. Overview:- Notifies about Increase/Decrease in Keyword rankings, No change on the SERP results, visibility in a % ratio and total number of keywords being monitored. Once you login, you’d see how simple the interface is. Once you’ve added the websites, click on the link and it would take you to your dashboard. Do checkout the left-sidebar, it’s the best thing about it. Every feature/option of TinyRanker can be accessed from right there. Do pay attention to the size of the icons, the font and everything else. It all looks so damn simple, right? You’d see the “Add Keywords” button right there if it’s your first time with TinyRanker (If you’ve already added keywords, ignore this point!) . Click on that button. On the next page, just add the keywords you want to monitor for your website. 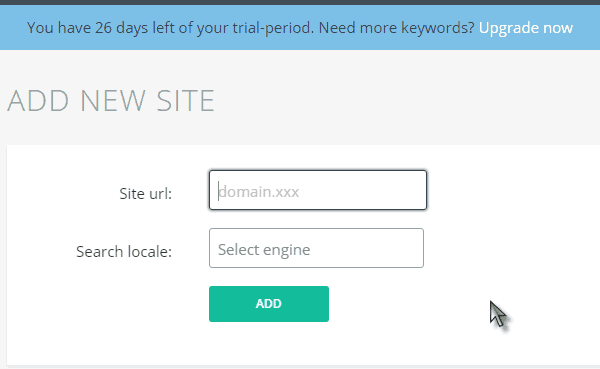 You can add as many as 50 keywords with the free trial account and click Add Keywords button. The keywords would be updated on your TinyRanker page, and you would see something like this. Well do not panic. When you add new keywords, it takes couple minutes for the tool to fetch you the rankings and stuff. So just wait, or in the meantime let’s checkout some other cool features, right? URL MONITORING:- You can see there’s that URL option on the left-sidebar, right? Click on it. The URL’s tab is what shows you ALL your URL’s which are ranking for the keywords you’ve entered into TinyRanker. Now there are individual tools to monitor this, which cost a LOT! While you get that feature pre-included with Tiny Ranker, right? You can just take that information and update those post, build new links and things like that to give them a jump on the SERP’s. This tells you which of your keywords are actually working for you. And I can’t possibly miss the Competitors tab, can I? Feel free to click on the competitors tab on the sidebar! You’d be surprised to see who you’re competing with! When you first click the Competitor button, it would take you to this screen. Now you need to click on the “compare” button to get some more detailed insights. Now you’re going to get the kind of data for which you hire “Spy tools” and Companies for thousands of dollars! See? 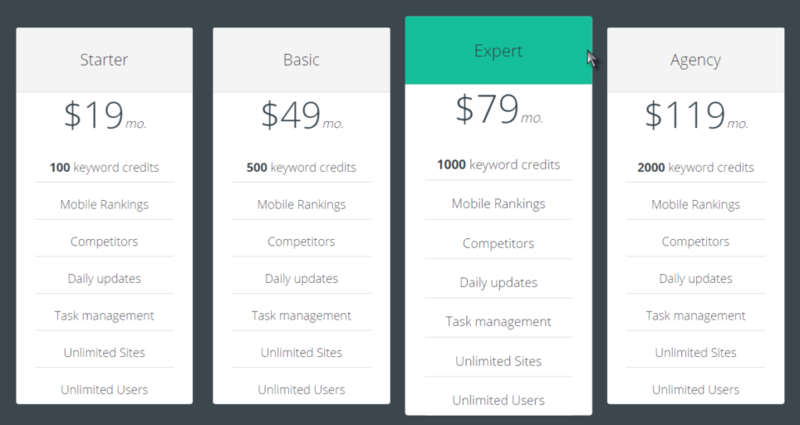 A detailed comparison, of YOUR rank, your competitors’ rank, and even their URL! What else do you need to beat them? The Keywords? Hold up, they’ve answered that too! Just hit the back button, and click “FIND” under the keywords option! It’s like gaining access to your competitors’ back-end, isn’t it? So see? Now you know if your keyword is ranking, where it is ranking exactly, how is the On page SEO, and what’s the volume! That’s pretty detailed analysis if you ask me! So that was it folks, that’s all I can cover in this TinyRanker Review. I’m sure all of this super-power for just $19 is totally awesome. But hey, I’m not asking you to buy them! Just head over their website and do try out their “Free Trial” once, trust me you’ll fall in love with the product. How Do Search Algorithms work? Thanks for reviewing Tiny Ranker. As it is money efficient to use tiny ranker. I will try this tool for my blog. Your post was very helpful for me. Thanks for sharing.